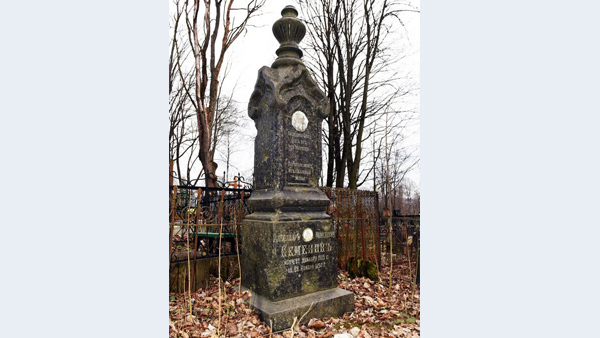 The Tikhvin cemetery appeared on the Smolensk map several centuries ago. In 1775, here on the donations of the local population was built the church in honor to the Tikhvin Icon of the Mother of God. During the occupation, the church was acting, but the Germans blew it up at the retrograde crossing. There were persistent fightings here, the same as in the whole Zadneprovye, in July 1941. The territory of the cemetery passed from hands to hands many times. Only the 129th Infantry Division under the commanding of Major-General A.M. Gorodnyansky took it three times and had to drop back three times. Then, the 152 Division, operating in the Red Bor region, took the cemetery territory twice, but it could not hold the position. The soviet soldiers defended every inch of the native land bravely and strightly. Nothing could resist their desperate courage, heroism and love for the Motherland. According to the Soviet press, the Nazis in the battle for the area, even chained their soldiers to the machine guns, not to retreat, but remain in their positions (it was mentioned in the newspaper «The Red Star»: the soviet soldiers found here such «die-hards» here. The names of the prisoners were called, too). If it was the truth – it is hard to say, but still the fact remains that the first detachments tactics during the World War II were used by the Germans and in 1941 they used it in the zone of the Army Group «Center» acting quite widely. But, even such practice could not influence on the determination of the Soviet soldiers, who defended their homeland from the aggressors. In 1943, there were still fierce fightings. At the cemetery monuments and gravestones appeared new “war traces” … Split by bullets and shrapnel cemetery tombstones remind on those times. The remains of 927 Soviet soldiers who died in 1941 and 1943 were buried in a mass grave at Tikhvin Cemetery. The names of most of them are known. The military grave is situated in the north-west corner of the Tikhvin civilian cemetery. It is enclosed by a metal fence, and in the center there is a black granite memorable stele-sign tapering upward, set in 1968. There are such words in its west side: «For Valiant Soviet soldiers, who fell in the battles for the freedom and independence of our Motherland. 1941-1945”. 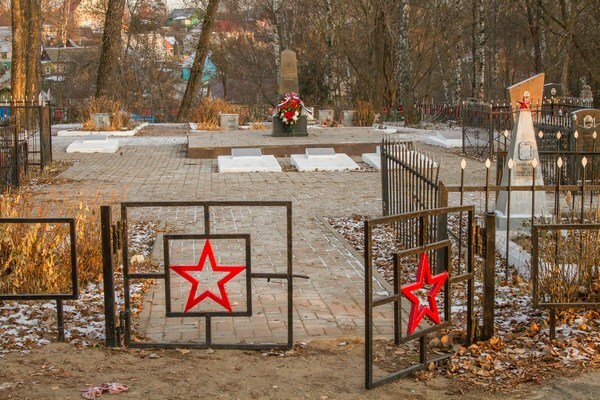 Currently the burial at Vitebsk highway, the Tikhvin cemetery, is the object of cultural heritage (the monument of history and culture) of regional importance «The military cemetery of 927 Soviet Army soldiers and officers, who died in 1941-1943 during the defense and liberation of Smolensk».